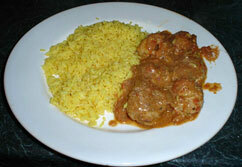 I doubt that pork meatballs is a particularly authentic Indian food, but I make no apologies - it is delicious. It is the type of dish you might find in Kerala or Goa where there are a larger number of Christians, who will eat pork. Muslims eat meat but will not eat pork and a majority of Hindus are vergetarian to some degree and those who do eat meat don't eat beef and rarely eat pork. The sauce is probably more typical of Northern India, using cream and tomatoes. You can be quite experimental with the spices if you wish as well as the other ingredients. I had thought of using yoghurt instead of cream but I thought it might be a bit sour. You can use passata (strained tomatoes) instead of whole ones if you wish. Tomatoes. Tinned tomatoes are much easier when making a sauce, you can use fresh Roma tomatoes but they will need to be peeled and will need to cook for a little longer. Chillies. Dried chillies are best for this or you can use chilli powder. Quantity to taste. Spices. You can experiment here - I have given a fairly simple set of spices - you can choose others of add to these to give a more complex taste. Oil. I use ghee for this but almost any cooking oil will do. Grate or finely chop the apple. Mix thoroughly with the pork mince together with a few twists of ground black pepper. Grab small handfuls of the mixture and roll into balls. Cover with a clean teatowel while you prepare the other ingredients. Put all the spices except the curry leaves into a dry frying pan and roast for a couple of minutes. Fry the meatballs, sealing the meat on all sides with a high heat. Simmer for about 20 minutes adding a little water if necessary. Meatballs. Obviously you can make the meatballs to a size of your liking. I like them about golf ball size but you can make them larger or smaller. Larger ones may need to cook a little longer. If you want the meatballs to have a little kick of their own then mix the dried chillis into the meat instead of the putting them with the other spices in the sauce.